Mary Shelley’s classic tragic horror fantasy has never been filmed with more genre goodness and tragic Hollywood sentimentality than the James Whale Universal classic. Of course, just as much of the novel was discarded as was retained. Instead, Whale and his writers, under the guidance of producer/studio head Carl Laemmle Jr., embellish the salacious and grisly details of Shelley’s concept and condense it into its own patchwork beast of a movie, not unlike the creature itself. Although, it should be stated that this film version was in fact not directly based on the novel, but rather Peggy Webling’s 1920s stage play. With that said, despite severe bastardization of the original story, the themes of scientific malfeasance and the attempts of man to become God and create man in man’s own image resonate as strongly as in the original book. Whale’s direction is simply masterful, employing the prevailing visual trends of the day, German expressionism and art deco to create a deliciously gothic and brooding look to his film. Just look at the fantastic opening sequence during which Dr. Henry Frankenstein (not Victor here) and his hunchback servant Fritz grave-rob the cemetery looking for his individual body parts. Whale’s gothic compositions, such as placing his characters in dark, nearly silhouetted black and white against the ominous studio-constructed cloudscape backdrop is rich with atmosphere. The Frankenstein castle and his experimental lair are meticulously constructed to reflect the futurism of the art deco style. We can’t help but see Fritz Lang’s Metropolis in both theme and the production design of the sets. Frankenstein makes an interesting comparison with 1933's King Kong. The monsters in both films are born from man’s insatiable desire to conquer science at all costs. Both Dr. Frankenstein and King Kong’s Carl Denham recklessly attempt to tame science and nature with such careless abandon that they tragically destroy an innocent life. 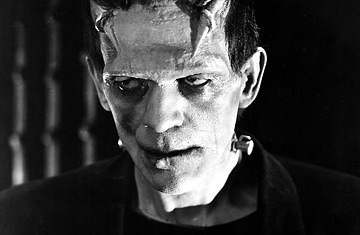 Like Kong, Boris Karloff is an unabashedly sympathetic monster. We compassionately identify with him after he’s birthed into being then frightened with fire torches by Henry and Fritz. Watching the monster cower in fear of Henry’s torches is a heartbreaking scene. And the subsequent heinous torture and imprisonment of the monster is directed with sincere humanism and compassion. And so when the monster inadvertently murders the young girl in the lake, it’s a sad and tragically ironic moment for the audience because we know the monster doesn’t know any better. He is like an infant, a product of his father or master, and the result of man’s general irresponsibility with the tools of science. Like King Kong, the hunt for and eventual destruction of the monster by the angry villagers is a tragic and sad moment for the audience. Whale’s magnificent staging of the scene, including the awesome final imagery of the burning windmill behind the bloodthirsty mob, is almost as powerful as Kong’s final fight atop the Empire State Building. They’re two of the greatest humanistic moments ever created in the genre of horror-fantasy.